The radical idea that nominally criminal acts should be understood contextually and that judgment as well as punishment should be administered accordingly opens up a wide assortment of questions about the conduct of our judicial system. What about the “systemic consequences?” Isn’t punishment for the commission of a crime supposed to act as a deterrent for others? Yes – in principle. That consideration, however, did not figure in the Holder-Obama doctrine as applied to financial misdeeds whose perpetrators are in a more visible position to set an example. Shortly before Attorney General Eric Holder left office, he gave his prosecutors 90 days to decide whether to indict any Wall Street executives for decisions that caused the 2008 financial crisis. Holder has now left the building at the Department of Justice (DOJ). Also gone is his deadline for punishing big bankers, none of whom were charged with a crime. Holder’s shop had six years to build cases against key people at institutions like Citigroup and JP Morgan Chase. It’s not known if prosecutors ever did that. What is known is that the only charges actually filed by DOJ lawyers have been against smaller fish, namely those working at small and medium sized banks, according the Center for Public Integrity (CPI). CPI’s Alison Fitzgerald reported that none of the five largest banks in the country are involved in criminal cases filed by the Justice Department that pertain to the financial crisis. At the SEC, only four of the more than 100 bank executives named in lawsuits were from the top five banks, according to Fitzgerald. The FDIC has sued nearly 2,000 bank executives, none of whom worked at any of the big Wall Street banks. For his part, Holder recently defended his efforts and that of the DOJ to prosecute individuals at the big banks for criminal wrongdoing. “To the extent that individuals have not been prosecuted, people should understand it is not for lack of trying,” he said. While the US government touted its “record” settlement reached this week with Bank of America for mortgage fraud that helped fuel the 2008 recession, the details of the agreement indicate yet another light punishment for an offending Wall Street titan. “This historic resolution – the largest such settlement on record – goes far beyond ‘the cost of doing business,’” Attorney General Eric Holder said in a statement. Yet the $7 billion in “relief” is considered a “soft money” fine, in which the bank will reduce some homeowners’ mortgages. Very few homeowners are eligible for the refinancing pursuant to the settlement, AP reported. Those who are eligible may need to wait years to see any settlement aid, as payouts will be ongoing through 2018. Those already in the hole following a lost home due to foreclosure or a short sale – when a lender takes less money for a home than what the borrower owes – are unlikely to benefit from the terms of the settlement. Outside of the $7 billion for consumers, the Bank of America settlement includes a $5 billion cash penalty and $4.6 billion in remediation payments. Large portions of the deal will be eligible to claim as business expenses, allowing the mega bank to treat them as tax write-offs. The deal echoes similar agreements the government reached with other Wall Street players, like JPMorgan Chase and Citigroup, for crimes committed surrounding the recent economic recession. No major bank executive has faced criminal charges following the mortgage crisis. Without significant retribution for banks and executives that knowingly passed off fraudulent mortgages, Wall Street players will continue to act with impunity, argued Dean Baker, economist and director of the Center for Economic & Policy Research. Following the Thursday announcement of the settlement, Bank of America’s stock rose more than 4 percent. 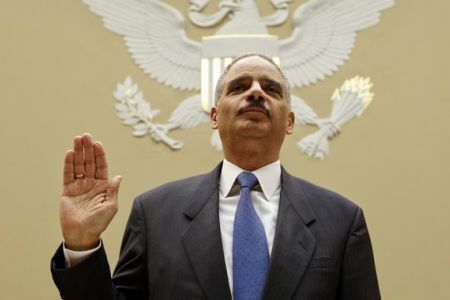 Holder then spends several paragraphs discussing both the investigation itself, as well as the actions of the Civil Rights Division before he turns – in the course of one paragraph — to the protests. Here, violence is described as violence. Even as more and more examples of questionable surveillance by the US government are revealed, the US is apparently still trying its “hey, look over there!” strategy in response. This morning, Attorney General Eric Holder is announcing that the US has filed meaningless criminal charges against members of the Chinese military for economic espionage done via the internet. Of course, there’s no chance of any actual prosecution happening here. If anything this is all just a bit of diplomatic showmanship. In fact, I wouldn’t be surprised to quickly see China respond in kind with “criminal charges” being announced against folks from the NSA for the various spying that they’ve done on China. US officials will, as they always do, insist that what the People’s Liberation Army does is “different” because it’s economic espionage, in which the Chinese army breaks into networks from certain industries and companies, and shares the details with Chinese companies. The US does not appear to do the same thing directly, though there are indications of indirect economic espionage (i.e., spying on companies to then inform general US policy that might help US companies). The Chinese have (quite reasonably) questioned how there’s a legitimate distinction between the different kinds of espionage. Either way, at a time when the US is under intense scrutiny for its questionable espionage efforts, including installing backdoors into US networking equipment (which is what they’ve accused the Chinese of doing repeatedly, despite no actual evidence), filing criminal charges against the Chinese for cyberspying… just looks really sad. It stinks of hypocrisy. The Attorney General of the United States of America Eric Holder has taken the unusual step of writing a letter to the Russian Federation essentially making promises that United States will do nothing unusual or in any way against U.S. law if the Russian Federation will just put aside its own norms, the Russian Constitution, international law and conventions and just, as the U.S. Ambassador put it, “return” Mr. Edward Snowden to the United States. The Attorney General begins his letter by listing the “crimes” that Mr. Snowden is charged with ignoring the fact that the laws that Mr. Snowden is said to have broken are not crimes in the Russian Federation, or perhaps Mr. General is under the assumption that U.S. law somehow is something that the rest of the world must abide by and follow. Judging from the real and documented history of the United States, the country possesses a total lack of respect or regard for international law and the laws of other sovereign nations, especially the Russian Federation. This is evident from the illegal invasions of sovereign nations, illegal torture programs, extra-judicial executions by drone and other means and with regard to Russia, the continuous illegal kidnapping and rendition of Russian citizens back to the United States. I have been documenting these crimes for over a decade and have been the victim of similar U.S. ‘retribution”, so hearing the Attorney General preach to Russia about U.S. law as it is engaging in asking Russia to also set aside its Constitution, as the U.S. does, and engage in double standards and hypocrisy, is something nauseating to say the least. The sheer hypocrisy that is evident in the U.S. actions surrounding Mr. Snowden and the level of desperation that the U.S. has shown are simply mind boggling in their breadth and scope. The whole point, in case Mr. Holder has missed it, which it is obvious he has, is that Mr. Snowden has been granted political asylum in several countries and had wanted to travel to those countries. Not face death or torture at the hands of a government that has secret torture prisons, launches wars of aggression at every political whim, has off-shore indefinite detention facilities and engages in regular extra-judicial executions, just to name a few of the continuing violations of international norms that the U.S. is guilty of. Such a government can and must never be trusted and that is a fact that can in no way be known better than by someone like Mr. Snowden who worked for the CIA and the NSA. So a one way ticket to America is not an option Mr. Holder. No one in their right mind would trust any of the assurances given by Holder, and Mr. Snowden is right, and moreover, has the right, to seek asylum and be protected. Again are we supposed to forget the last several decades of world history? Are we supposed to forget Manning who has been tortured, are we to forget Abu-Ghraib, Guantanamo and even ex Vice President Richard Chaney signing off on such torture techniques as “puncturing an eye” and “slicing a testicle”? Are we to forget case after case after case and report after report of other instances of torture, extra-judicial executions and even innocent men and women being executed when there was evidence that exonerated them? Mr. Holder insults our intelligence. It is interesting to note that he says “unlawful” and not “illegal” and this whole argument is absurd regardless of the wording because we know the U.S. renditions people all the time to countries where torture is legal and we know the U.S. has its own special off-shore torture prison at Guantanamo. Simply unbelievable. The rest of the letter goes on to say that Mr. Snowden would be granted a fair trial blah blah blah… Yeah good one Mr. Holder, just like the NATO 5, Jeremy Hammond, Bradley Manning, Julian Assange, Muammar Gaddafi, Saddam Hussein, everyone who has ever been droned, the hundreds of men at Guantanamo and let’s not forget how Trayvon Martin’s family got justice, etc. ad-nauseum. The United States has become a rogue illegal nation and the continued persecution of Mr. Edward Snowden, a young man who exposed that rogue nation’s illegality against the world and its own citizens and more importantly Mr. Holder, against the very Constitution you are sworn to uphold, prove beyond all doubt that Mr. Snowden is in very grave and imminent danger. Please don’t insult the intelligence of the world and the Russian Government by engaging in such ridiculous letter writing Mr. Holder. We all know that once Mr. Snowden is in your hands, and I pray for him that never happens, he will be interrogated using your “enhanced interrogation techniques” until he goes insane or kills himself and if he does survive he will be locked in solitary confinement under special observation until the day he dies, that is of course if he is not executed, as nothing will stop you from executing him once he is in your hands. Will a letter from the Russian Government saying execution is illegal stop you if there comes a day when the switch is about to be pulled on Mr. Snowden? No. So why should your false guarantees force Russia to violate its own Constitution? By the way Mr. Holder, how are Mr. Bout and Mr. Yaroshenko faring after you illegally renditioned them from third countries? Rule of law? Only when it is convenient for you and those in power. Mr. Snowden exposed your illegality, as did I and we know what happens to those who expose the illegality of the Imperial United States of America. Just ask Julian Assange. And lastly, just in case Mr. Holder was not aware: The Russian Government knows what you are up to better than you think Mr. Holder, Russian officials and the Russian Government are not fools, after all Mr. Snowden won’t be the first American who has received asylum in Russia due to the illegality of the American state. He won’t be the first, because actually, I was. The opinions and views expressed here are my own I can be reached at robles@ruvr.ru. The records included outgoing call numbers, the AP said, but it is unclear whether prosecutors also obtained incoming call numbers or the duration of calls. The news organization said it had no reason to think that the government listened in to the content of the calls. The government did not reveal why it seized the records, but the AP noted that federal officials have previously said they were investigating who had leaked information to the news service about a foiled terror plot in 2012. An AP story in May 2012 included details about a CIA operation in Yemen targeting al Qaeda operatives. Republicans were quick to criticize the Department of Justice (DOJ), saying that the invasion of privacy of a news outlet was just the latest example of an administration rife with problems. News of the AP probe broke as the White House is already fending off criticism of its handling of last year’s attacks on the embassy in Benghazi, Libya, and the revelation that the Internal Revenue Service had targeted conservative and Tea Party groups. House Oversight and Government Reform Committee Chairman Darrell Issa (R-Calif.) called the DOJ subpoena “very disturbing” and said he expected to team up with House Judiciary Committee Chairman Bob Goodlatte (R-Va.) to probe the issue further. Department policy requires that the attorney general sign off on all requests for reporter phone records. It is unclear whether Attorney General Eric Holder signed off in this case. Rep. Frank Wolf (R-Va.), the chairman of the Appropriations subcommittee that oversees the Justice budget, said the department’s move was reminiscent of the wiretapping authorized by former President Nixon’s administration. The AP’s Pruitt sent a letter on Monday to Holder protesting the seizure of records, demanding that the government return the call records to the AP and destroy its copies. In a statement, the U.S. Attorney’s Office for the District of Columbia said it takes its legal obligations and department policies seriously when subpoenaing media phone records. Senate Judiciary Committee Chairman Patrick Leahy (D-Vt.) also said he would be probing the issue further and looking into whether the government may have overstepped its bounds. Apparently stung by mounting criticism of its remote control assassination program, the Obama administration early this month secretly reneged on an Air Force promise to “provide more detailed information on [drone operations] in Afghanistan” by failing to provide data on drone strikes for February. And in an Orwellian twist, the Air Force removed the previously released data on drone strikes from the reports for October 2012 to January 2013. According to the data, the Air Force actually relies more heavily on piloted aircraft to conduct airstrikes, with drones responsible for only about one-quarter of missiles fired. The data shows that the Air Force conducted 1,366 drone strikes in Afghanistan between 2009 and January 2013. Although casualty figures were omitted, it is known that the U.S. has killed between 3,049 and 4,376 civilians in Pakistan, Yemen, and Somalia during about 500 “covert” drone strikes, including at least 179 children—the equivalent of 9 Newtown child massacres. Indeed, parents who have seen their children killed by U.S. bombs don’t care if the person who pushed the button that released the bomb was inside an airplane or in a control room thousands of miles away. The “sanitized” reports without the drone strike data were created on February 22, just two days after Sen. Rand Paul (R-Kentucky) threatened to filibuster the nomination of John Brennan to be CIA Director over Paul’s concerns that the Obama administration believed it had the authority to use drone strikes inside the U.S. Joined by Sen. Ron Wyden (D-Oregon), Paul filibustered for almost 13 hours, finally getting a denial from Attorney General Eric Holder that this administration believes it has such authority. Although the Defense Department released a statement claiming the data was removed to make the reports more accurate in light of the unsupported assertion that most drone operations do not include strikes, the Pentagon also took pains to state that it was not involved in the decision to hide the data. That can only mean that the decision came straight from the White House—almost certainly from President Obama himself, who, ironically, promised in 2008 to run the federal government in a more open and transparent manner.